The Rotary Club of Athlone hosts its fourth annual fundraising concert on Friday, August 31, in the Radisson Blu Hotel in Athlone. Similar to last year, the event will be in aid of Athlone Special Olympics Club. Funds raised from that particular event contributed towards sending fourteen athletes to the Irish Summer Special Olympic Games which were held in Dublin in June. Serving a dual purpose, the fundraising event will also showcase emerging Midlands talent, many of whom intend to ply their their love of music professionally in the future. 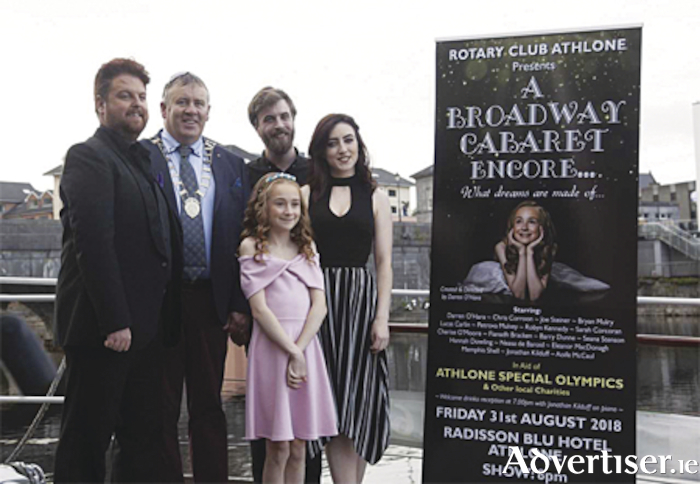 The show is created and directed by local baritone, Darren O’Hara, who is returning to the helm for his fourth successive year working in tandem with the Rotary Club of Athlone. Speaking about the fundraising event, Darren enthused as to what the production will entail on August 31. "It is my absolute pleasure to create another show for Rotary after the sell out success of last year's show 'A Broadway Cabaret - ENCORE'. After three wonderful years directing, creating for Rotary and showcasing so many amazing performers such as Petrova Mulvey, Cherise O'Moore, Joe Steiner to name but a few, I felt it was time to introduce a brand new shining star and that is our beautiful and talented Aoife Mc Caul, who's guaranteed to steal your heart just like my original angel of music Cherise O'Moore did three years ago. "This show will follow a little girls dreams of becoming a Broadway star which will form the backdrop for a Cabaret show full of musical theatre classics from Phantom of the Opera, Les Miserables, the Greatest Showman and many more. So let us once again transport you to world where dreams do come true, a world where you can see your favourite musical numbers come to life before you very eyes," Darren added. The Athlone Special Olympics Club is a registered charity run completely by volunteers who work tirelessly in the Spirit of the Olympics, to bring great joy into the lives of these special members of our community. Patricia Cleary, Chairperson of the Athlone Special Olympics Club highlighted that the club was founded in 2004, as a direct result of Ireland’s great success in hosting the Special Olympics World Games in 2003. The club, now boasting 47 members, continues to grow since its formation which is largely due to the dedication and commitment of a wonderful team of volunteers. Club Athletes have competed in all the National Finals, bringing home gold, silver and bronze medals on all occasions. Patricia added the club gives athletes continuing opportunities to develop physical fitness, demonstrate courage, experience joy and participate in a sharing of gifts. The life skills and friendships afforded to our members, along with their families and other Special Olympic athletes, makes the work of our club so rewarding. Expressing his gratitude to local businesses for their sponsorship to date, Tom noted that it was a pleasure to collaborate with Darren once again for the forthcoming musical spectacle. "Darren puts so much into the planning of the fundraising concert each year, as soon as the new year arrives, he's on the phone with such excitement about the show that he has put together for Rotary. I also want to thank the Radisson Blu Hotel for hosting the event once again this year." Rotary Club Athlone, Athlone Special Olympics, Darren and his cast look forward to welcoming all to what promises to be the greatest Rotary concert production of the past four years. With its stellar cast, professional creative team and full Broadway Theatre sound experience, a full house is certain. A BROADWAY CABARET - ENCORE promises to be the musical theatre event of the season. Tickets are on sale for €20 from hotel reception in the Radisson Blu or any Rotary Members.